Young Audiences Arts for Learning Week is a week-long advocacy event celebrated by the entire YA network to advocate for the benefits of arts education and arts integration. This year, 30 affiliates in 22 states participated by hosting arts events, creating new programs, and raising awareness of the importance of the arts and our belief that the arts are an integral part of a well-rounded and transformative education. 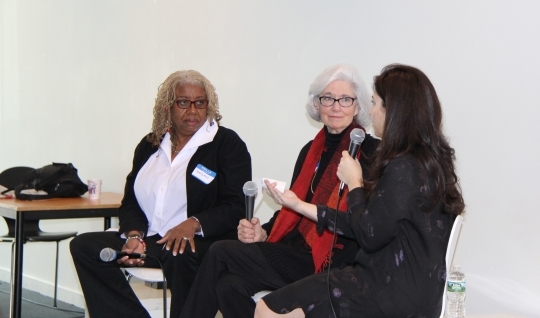 In honor of YA Week, Young Audiences New York hosted their second annual “Insights to Action” Forum, entitled Children’s Creativity: What’s the Big Whoop? at the Scandinavia House, on Thursday, March 31, featuring guest experts Shirley Brice Heath, Sarah Calderon, and Beverly Ellis. In attendance were a diversity of participants from across education, youth and community development, philanthropy, business and the arts. Eileen explained that last year’s forum helped Young Audiences New York clarify its strategic direction: confronting the opportunity gap for children growing up in poverty through a “place based approach” to give children and youth more chances to create in school, with their families, and in their neighborhoods. In follow-up, this year’s forum was arranged to drill deeper into why children need the chance to create—and why their creativity is necessary for their neighborhoods. Eileen noted that we are especially excited to be having this conversation now, as Young Audiences New York is poised to launch “community creation labs” this spring. Guest Experts - A Big Whoop! Shirley Brice Heath is a linguistic anthropologist, educator, and author who studies learners across their life span in non-formal environments. Working with community arts organizations, she has examined the learning outcomes that result when youth living in under-resourced communities participate in planning, creating, producing, and critiquing art works in a variety of forms and disciplines. Studies such as Ms. Brice Heath’s own “Living the arts through language learning: A report on community-based youth organizations” (Heath, S.B., Soep, E. & Roach A. 1998) demonstrate positive relationships between active participation and engagement in the arts and increased development of critical thinking skills and constructive risk-taking. Sarah Calderon is the Managing Director of Art Place America, an organization that emphasizes creative placemaking and using the arts and culture to help build healthy, thriving communities. Sarah previously led the Casita Maria Center for Arts and Education in the South Bronx and was recently honored by No Longer Empty. Beverly Ellis is the recently retired principal of PS 173-236X in the Tremont neighborhood in the Bronx, where Young Audiences New York has worked with children, teachers and family for over eight years. Ms. Ellis is a strong advocate for the use of the arts in the classroom to boost creativity and promote more complete learning. Shirley Brice Heath kicked off the conversation by sharing new research from the New York Science Lab that shows a direct link between broad spectrum engagement in the arts and increased brain development. The report’s findings indicated that after only five weeks of experiencing arts in different forms, coupled with opportunities to draw, sculpt, cut with scissors and create art of their own, MRI scans of study participants showed significantly measurable increases in neuronal connectivity when compared to the preliminary scan prior to the study. Shirley contrasted the research findings with observations on the sad reality that “the work of the hand” is becoming less and less a part of the lives of families today. Regarding the impact of accessible and visible arts programs on a wider community level, Shirley spoke about the work that she and her Stanford University Colleagues have done over the past twenty years, studying communities in distress and identifying sustaining features that are the most effective in reducing crime. The team had found that an increase in arts and arts programming seemed to be a common factor in communities that were experiencing a decrease in both crime and gang related activities. 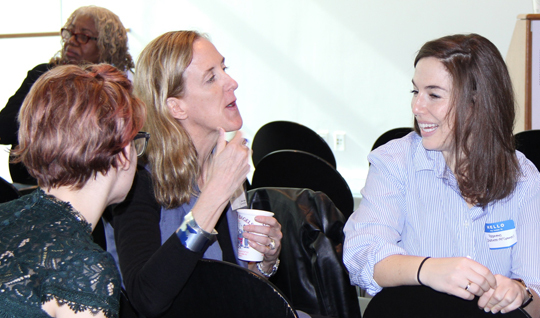 Shirley observed that there is no better place for starting the spiral of creativity than in community, with families and jumped into an interactive discussion with Sarah Calderon, Beverly Ellis, and ultimately all of the guests gathered for the conversation. Sarah Calderon emphasized the importance of having high expectations for youth—really believing that they can be at the table with artists and community members who are using art to solve neighborhood challenges. As she said, if you don’t really believe in what youth can do, you shy away from bringing them to the table in an authentic way. Calderon also emphasized the importance of recognizing and involving neighborhood artists—often the parents of children in community arts projects. Beverly Ellis, concurred, talking about how important it is to demonstrate to children that what they create is of value. She addressed the challenges of giving arts a central role during the school day and encouraging school leaders and teachers to be brave and trust their instincts about children in the face of what can be an overwhelming variety of mandates and rules. Inquiries and ideas from guests included how do we best prepare artists for working with children, encourage and empower parents to experience and create art with their children . There was robust discussion about why with all the scientific results, we are still fighting uphill battles for the resources and time to give all children more chances to create. On behalf of Young Audiences New York, Eileen thanked the guest experts and everyone in attendance, noting that Young Audiences New York is eager to make more art happen “in the intersection of schools and neighborhoods.” As she said, “We want all children to have arts in education—as well as the opportunity to access and create arts in their neighborhoods, especially in response to community needs.” Eileen closed by encouraging all participants to reach out with ideas for collaborative action—and to come back next year for our third annual “Insights to Action Forum” in celebration of National Arts for Learning Week 2017.